members on the number one wedding website - completely FREE of charge! Why promote your Wedding Fair on UKbride? Our directory is consistently in the Top 3 on Google for the top Wedding Fair search terms. Full Free Listing with a dedicated page containing your contact details, map, gallery, detailed description, website link & more! Your fair will be shown to brides-to-be in your area on their member walls. You'll be in good company with the UK's largest wedding fairs using our directory. 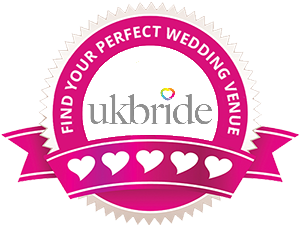 To take advantage of this fantastic free publicity, all we require in return is for you to place the UKbride badge below on your website's homepage - this is a great way to refer brides to our website to help them plan their wedding. The great news is, as long as this badge remains on your website you can continue listing all fairs you arrange, completely free of charge! All you need to do, is give us a call on 0800 112 3 112 or email us - [email protected] once you have placed the badge on your site. We'll check it's in place and give you a unique code for you to use so that you can set up your listing using our easy step-by-step system. Did you know you can also advertise on UKbride?